The CARICOM passport is a passport document issued by the 15 member states of the Caribbean Community (CARICOM) for their citizens. It can be used both for intra-regional and international travel. The passport was created to facilitate intra-region travel; however, citizens of the OECS that are citizens from Antigua and Barbuda, Dominica, Grenada, St. Kitts and Nevis, Saint Lucia and St. Vincent and the Grenadines may use a member-state issued drivers licence, national identification card, voters registration card or social security card for travel within the OECS area. As of early 2009, twelve Member States had introduced CARICOM passports. These states are: Antigua and Barbuda, Barbados, Belize, Dominica, Grenada, Guyana, Jamaica, St. Kitts and Nevis, St. Lucia, St. Vincent and the Grenadines, Suriname and Trinidad and Tobago. 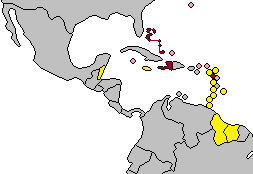 CARICOM members who have not yet issued the common passport are the Bahamas, Haiti, and Montserrat. As Montserrat is a British Overseas Territory, citizens of Montserrat became full citizens of the United Kingdom in 2002, and so a common passport is unlikely to be introduced for them. In the case of Suriname, the passport is adorned with the national symbols for the Republic of Suriname, as well as the CARICOM insignia on its cover. President of the Republic of Suriname Ronald Venetiaan received the first of these new CARICOM passports. Antigua and Barbuda’s design is to feature the country’s coat of arms and country name, as well as the CARICOM logo. The passports for Suriname were created by the Canadian Banknote Company Ltd (CBN) under a five-year programme with a price tag of US$1.5 million. It is believed other member states of CARICOM will now soon follow with the introduction of their own branded version of the national ‘CARICOM’ passport. On Friday, 7 January 2005, the Republic of Suriname became the first full member state to officially launch the new bloc “CARICOM Passport”. The new passports boast having better security and are also machine-readable. The full member states of the Caribbean Community had agreed to establish a common passport in order to make intra-regional and international travel easier for their citizens. The passports are also thought to save additional costs for member states by using a similar cover design, the designs will also follow newly updated international standards on passport design. The second state to release the national CARICOM passport was Saint Vincent and the Grenadines: SVG began issuing the new CARICOM passports around April 2005. On 25 October 2005, St. Kitts and Nevis became the third CARICOM member state to bring the CARICOM passport into operation, making good on its promise to launch it before the end of the year and began issuance of the document to its citizens on 14 November 2005. Antigua and Barbuda announced that it would begin using the new CARICOM passport format by the middle of 2005. St. Lucia proposed introducing the common passport in early 2007 and actually introduced it on 16 January 2007. Trinidad and Tobago announced that it would begin to issue the new CARICOM passport in June 2006, and then indicated that it would introduce the passport in July 2006 along with Guyana, but only introduced the passport on 24 January 2007. Grenada planned to begin issuing the common passport in mid-2006, but started issuing them on 29 January 2007. Barbados had planned to switch to the common format by late 2006, but then proposed to introduce it by 31 December 2007. Barbados launched the new common-format passport on 1 October 2007. Guyana had also announced that it would begin to use the new CARICOM passport format by the middle of 2005, but the introduction was delayed and the new target date was set to July 2006. However, Guyana eventually officially launched the passport on 13 July 2007. Jamaica was expected to institute the passport by the end of 2007; however, this deadline lapsed, and Jamaica was then expected to introduce the passport by January 2009, finally launching the passport on 2 January 2009. Belize was expected to introduce the passport by 31 December 2007 after its current stock was depleted, but ultimately Belize introduced the passport on 17 March 2009. In doing so Belize became the twelfth and last country in the CSM to introduce the passport and its introduction was the reason why Belizeans had been having trouble renewing or obtaining new passports as the Belizean Ministry of Immigration and National Security awaited the arrival of a shipment of the new travel documents. The expectation was that all the member states would have introduced the CARICOM passport by 2008 when the stock of their old passports is depleted. This deadline was missed by a year, and by 2009 all CSME participating states had introduced the common passport design. The Bahamas has not launched the machine-readable passport, and instead launched the e-passport on 5 December 2007. Montserrat is not expected to change the design of its passport because the island is a British overseas territory. ^ “Global Ranking – Visa Restriction Index 2018” (PDF). Henley & Partners. Retrieved 23 May 2018. “‘What purpose does the Caricom passport serve?‘“. Jamaica Observer. 30 January 2013. Retrieved 10 February 2012.